Illinois Gov. Bruce Rauner is taking on the state’s unions by proposing right-to-work zones in some of Illinois’ economically-depressed areas. But Rauner says he is not advocating that Illinois becomes a right-to-work state. On the city’s West Side, where African American men suffer one of the highest unemployment rates in the country, no one we talked to worried that the governor’s call for right-to-work zones might lead to lower wages. “When it comes to us, especially in the younger generation of the black community, any wage is a better wage than zero,” said Mark Carter, an activist. During Tuesday’s presentation in Decatur, the newly-elected Rauner said union membership should be a choice in communities that want it that way. The venture capitalist-turned politician says companies would flock to Illinois right-to-work zones where labor costs would be cheaper. “It would be very important for us to become competitive against Indiana, Michigan and these other states through more right to work laws,” said Ted Dabrowski of the Illinois Policy Institute. “It’s very hard out here, period,” said Ted Davis, a 44-year-old who has been unemployed for 10 years. Davis would like to see trade unions in less control of the construction industry, where he says African Americans find it most difficult to find work. “They do what they have to do for their own people,” Davis said. Activist Carter told me Rauner’s plan will benefit from an increasingly-strained relationship between African Americans and organized labor. “When it comes to my generation, we have never benefited from the relationship the establishment in the black community has had with the unions,” Carter said. The right-to-work zones would have to be approved by the General Assembly, both chambers of which are controlled by Democratic super majorities. Jeffery Plaza could get a new grocery store as early as this August. Robert Liska, of River Forest, Ill.-based investment and real estate firm Liska Management, told attendees at Ald. Leslie Hairston’s monthly 5th Ward meeting tonight that he is in the final stages of negotiating a lease for the 64,000-square-foot space formerly occupied by Dominick’s. He said he expects to sign the lease within the next seven days and open a store by the beginning of August at earliest and early September at latest. Liska said negotiations have been taking place for months. Liska said the store would be part of a new chain, World Fresh Foods, and the first of five locations on the South Side. Chicago is likely losing tens of millions of dollars in per year in revenue to corporate tax dodging at the state level. Hispanic leaders said Wednesday that President Obama’s failed effort to pass immigration reform kept many of their supporters away from the polls. For Latinos who are also U.S. citizens, immigration reform remains a top priority. Many Latino Americans have extended family that is undocumented and living in the country. Teresa Berumen is among those calling on President Obama to use his executive powers to provide immigration reform measures that Congress has failed to implement. The president promised administrative action after the election. Members of the Illinois Coalition for Immigrant and Refugee Rights (ICIRR) say they’re tired of waiting.”Now that the election is over, it’s really time to keep his promise,” says Inhe Choi of the Korean American Resource Center. President Obama says immigration reform is his top legislative priority and repeated his promise to take administrative action during his post-election news conference Wednesday afternoon. “What I’m not gonna do is just wait,” Obama told the press. “In the meantime, let’s figure out what we can do lawfully through executive actions.”Congressman Luis Gutierrez says many Latino voters have been disillusioned by failed efforts at immigration reform and were not motivated to vote. He thinks that may be an important reason why Democrats lost ground nationally to Republicans yesterday. “What did you get? Nothing. You lost the senate and you angered and disillusioned a community that has always been so loyal to you,” Guttierez said. The ICIRR is taking the president at his word. They are already preparing to reach out to and educated the undocumented community once the president announces his measures. The president said he will do that before the end of the year, but he is also hoping Congress will pass legislation that would supersede executive action. Governor-elect Bruce Rauner announced additional members to his transition committee as he prepares to take office. Speaking publicly for the first time since Tuesday night, Rauner appeared rested and relaxed as he introduced his transition team that will help him form his new administration. “We are committed to making our transition team broad, inclusive, diverse, representative of the leadership throughout the state of Illinois,” Rauner said. Former U.S. Commerce Secretary Bill Daley- a one-time possible Democratic candidate for governor -is on the team as well as former Democratic State Sen. James Meeks. Not present Thursday afternoon, but also on the 27-member team, is former Republican Gov. Jim Edgar. Rauner choed two key words on Thursday: compassion and competitive. “I am personally committed to making Illinois the most compassionate state in America and the most competitive state in America. I believe very strongly there is an important role for government to help those who are vulnerable,” Rauner said. With that vision, part of his transition team spoke, including businesswoman Arabel Alva-Rosales, Rev. James Meeks, and Bill Daley. “All of us, Democrats, Republicans, Independents must move forward together and support our new governor,” said Bill Daley. It’s a bi-partisan message and diverse group, but what does this mean? “Rod Blagojevich had a great transition team, too. Doesn’t necessarily indicate you’re going to have a successful run as governor. But again, it’s part of the game, it’s a little bit of the show,” said Paul Green, director of Roosevelt University’s Institute for Politics. On education, Rauner said schools must be properly funded. “He should be in a good position to speak directly to his friends who have money and say, “friends, we have to chip in for good quality schools,” said Jesse Sharkey, vice president of the Chicago Teachers Union. Rauner also said Thursday afternoon that despite a looming budget deficit caused by the year-end expiration of most of the income tax increase, he does not want the lame duck General Assembly to consider extending the higher tax rate until after he takes office on January 12. “I hope that there will be no real significant action taken during the lame duck and with a governor on the way out. I hope that anything of is significance to be addressed can wait until mid-January so we can all deal with it together on a bipartisan basis,” Rauner said. Rauner said he would be disappointed if lawmakers passed and Gov. Pat Quinn signed a bill to raise the minimum wage that did not include pro-business reforms. “I support raising the minimum wage, I hope and believe the General Assembly should and will raise the minimum wage but I strongly recommend we include it in an overall reform package that increases Illinois’ competitiveness. So we raise the minimum wage but get workers comp reform, tort reform and tax reform,” Rauner said. The governor-elect’s next move is to thank voters during a statewide tour on Friday. On last Friday, Claretian Associates joined fellow Safe Passage programs throughout the city of Chicago to celebrate the $10 million investment in the safety of children attending school. Thanks to the advocacy by former Gov. Pat Quinn, Claretian Associates was able to hire an additional 14 Community Watchers to help children from Bowen High School, Corliss High School, and Burnham Elementary School get to and from school safely. Within South Chicago, our team has seen first-hand the impact Safe Passages has on not only keeping children safe, but also reducing truancy, and improving school performance among its students. Community Watchers play a vital role in the overall revitalization of South Chicago.We are more than excited to expand our team and increase our impact on the South Chicago community! 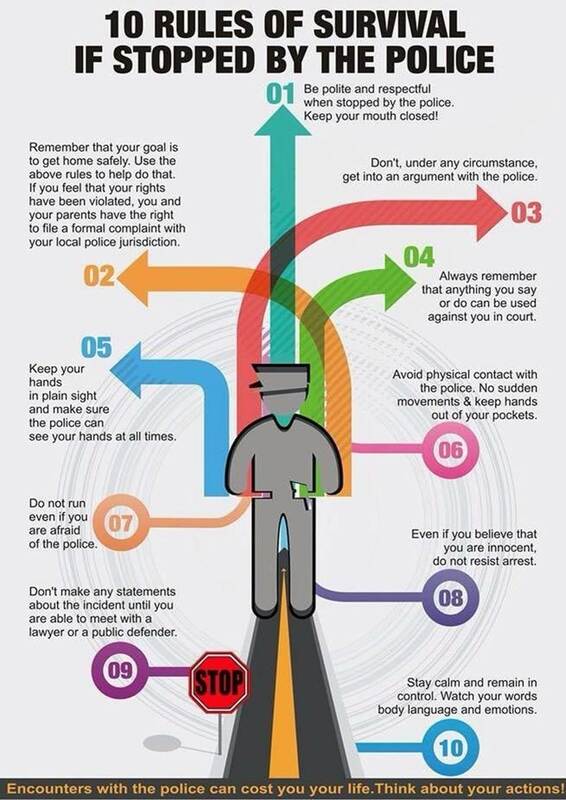 10 Rules of Survival If Stopped by The Police (Black Star Project)…. 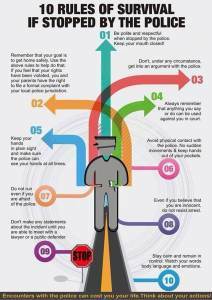 The Dare To Be King Project founder David Miller created a flyer with 10 Rules of Survival If Stopped By Police that has went viral. The Dare To Be King Project inspires, supports and strengthens organizations that provide services to boys of color. With the death of Ferguson, MO unarmed teen Mike Brown, and hundreds more young Black men this year, many are looking for answers and ways to end these senseless killing at the hands of officers. An Illinois judge ruled a law intended to fix the nation’s worst state employee pension crisis violates the state Constitution. Sangamon County Circuit Judge John Belz ruled Friday in favor of state employees and retirees who sued to block the state’s landmark pension overhaul. The state is expected to appeal the ruling directly to the Illinois Supreme Court. Lawmakers approved the measure, which would have risen the retirement age and reduced the cost-of-living benefit, about a year ago. Years of underfunding had put the state’s pension systems roughly $100 billion short of what they need to cover benefits promised to employees. Public employee unions challenged the measure under the Illinois Constitution’s Pension Protection Clause. “The constitution is very clear in Illinois. It’s unambiguous. It says you can’t diminish or impair pension benefits,” Dan Montgomery, Illinois Federation of Teachers, said. 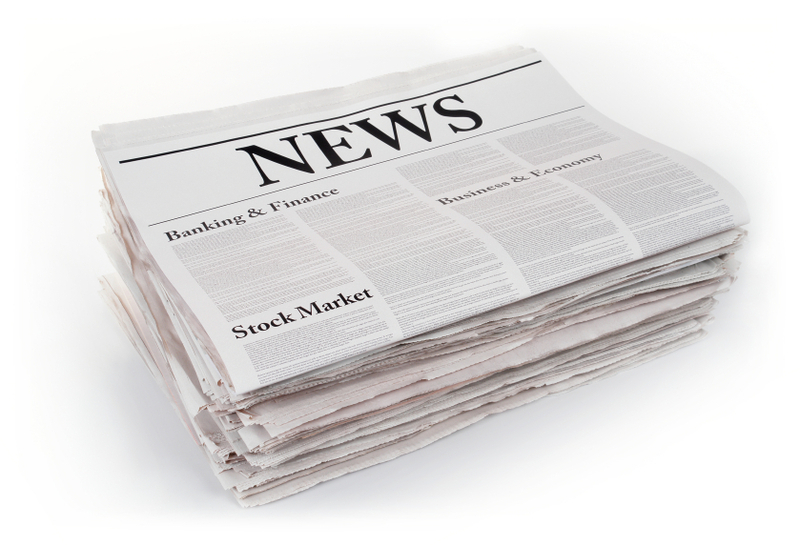 The law reduces benefits for retirees, but also reduces employee contributions. The lawsuit argued that the Constitution prohibits reducing benefits or compensation. Illinois has a projected $110 billion deficit in its pension obligation. The debit is behind the state’s worst-in-the-nation credit rating. If the Supreme Court upholds the Sangamon County ruling, the Democratic-controlled General Assembly will have to go back to the drawing board in Springfield. President Obama’s decision to normalize diplomatic relations with Cuba “chips away” at the nation’s “hermetically sealed society,” the president said today at what is likely his last news conference of the year.”This is still a regime that represses its people,” the president acknowledged. “But what I know, deep in my bones, is that if you’ve done the same things for 50 years, you should try something different if you want a different outcome.””Suddenly Cuba is open to the world in ways that it hasn’t been before,” he continued. “Over time, that chips away at this hermetically sealed society and, I believe, offers the best prospect of leading to greater freedom, greater self-determination of the Cuban people.”In the wide-ranging press conference, Obama also addressed Republicans’ anger over his executive action on immigration.”If executive action on areas like minimum wage or equal pay or having a more sensible immigration system are important to Republicans, if they care about those issues, and the executive actions are bothering them, there’s a very simple solution, and that is, pass bills,” he said, adding that he had “showed not only great patience, but flexibility” as he waited for the House to pass an immigration bill he could sign. Obama promised to implement “concrete, practical” fixes to correct the “bad habits” that some law enforcement organizations had developed over time. Of course, the president touted his economic accomplishments this year. The president leaves Washington on a high note, having made progress on several top priorities as he heads into the final two years of his presidency. In recent weeks, the president negotiated an unprecedented climate deal with China, took unilateral actions to reform the nation’s immigration system and announced a historic thawing of relations with Cuba. Despite these successes, the president’s approval rating remains dismally low, hovering around 40 percent. CBS) Pam Zekman – Ghost voters are legendary in Chicago politics. But now, the CBS 2 Investigators have learned thousands of ghosts have been getting more than $6 million in property tax exemptions in Cook County for decades. The Cook County Assessor’s Office is cracking down on this type of tax fraud. Under a $1.3 million contract with Lexis Nexis, Social Security lists of dead people were cross-matched with those getting senior exemptions and senior property tax freezes. The Chicago gravestones of John and Stanislawa Iwanyszyn show the couple died in 2005, but their names have been used to get senior exemptions and freezes at the Northwest Side home where they used to live — for a total savings of $24,151 in property taxes for the current property owner. It’s just one of thousands of improper exemptions Assessor Joseph Berrios is removing from the records. So far, they’ve caught 3,809 erroneous senior exemptions that collectively gave property owners $6.2 million in tax breaks they did not deserve. It’s a cliché that dead people used to vote in Cook County, but Berrios says dead people getting tax exemptions will be stopped immediately. “All these individuals that are doing this should be put on notice: We will find you, and when we do find you we’re going to put liens on you property if you don’t pay the money that you owe us,” Berrios says. CHICAGO (CBS) – A state lawmaker from the West Side avoided jail time Friday, when a federal judge sentenced him on misdemeanor tax evasion charges. “I just want to say hallelujah, and praise the Lord for a system that we can now look to to say that it is possible for people to receive justice,” Rep. La Shawn Ford (D-Chicago) said after he was sentenced to probation and a fine for a single count of tax evasion. He had faced much more serious charges before arranging a plea deal with federal prosecutors. Ford was re-elected Tuesday, after running unopposed in the 8th Representative District on the West Side. Ford pleaded guilty earlier this year to a single misdemeanor count of filing a false tax return. In exchange, federal prosecutors dropped more than a dozen much more serious felony counts of bank fraud and other charges. At Ford’s sentencing hearing on Friday, U.S. District Judge Rebecca Pallmeyer said she was glad she didn’t have to send the 42-year-old lawmaker to jail, citing his rise from poverty and difficult circumstances to become a respectable public servant. However, Pallmeyer called Ford “careless,” and said he made a mistake in regard to his 2007 income tax return. Pallmeyer sentenced Ford to 6 months probation, a $1,000 fine, and 100 hours of community service. She also ordered him to pay $3,782 in restitution to the Internal Revenue Service – the amount of taxes he owed on his 2007 income tax returns. Ford has said he’s sorry for underestimating his taxes, and he said he is already paying back what he owes. His attorney, Thomas Durkin, said it was extraordinary that everyone at the sentencing hearing, including prosecutors, seemed to feel Ford should not face jail time. According to a copy of Ford’s plea agreement, he earned income by investing in real estate and rehabbing property. In March 2007, he sold a single-family home at 5700 W. Erie St. for $275,000. According to the plea, when he filed his 2007 federal tax returns the next year, he claimed $74,226 in rehabbing costs for the Erie Street home, when in fact the costs were only $51,160, resulting in a $3,782 tax benefit. Allowing Ford to plea down to a single misdemeanor was a rare and surprising move for the feds, who agreed to reexamine the evidence in the case and drop the felony charges in the case after initially charging ford with 17 felonies. In November 2012, Ford was indicted on 17 felony counts of bank fraud and submitting false information to the now-defunct ShoreBank. At the time, the feds alleged he got a $500,000 extension on a line of credit for his real estate business in 2006, then used the money to pay off personal and campaign expenses – including car loans, credit card bills, mortgage payments, and gambling. Ford’s plea deal made no mention of any of those allegations, and prosecutors have never explained why they declined to pursue the more serious charges. Local 004th District Police Officers captured thieves who have been stealing catalytic converters. Catalytic converters are automobile parts located on the underside of a vehicle. These parts cont…ain a valuable metal that has significant scrap metal value. Thieves use cordless saws to quickly cut away the converters and sell them as scrap. Police have been closely watching local suspects, today they saw two of them, and attempted to pull them over. The suspects fled trying to avoid arrest. The police stopped their pursuit in the interest of safety. Moments later, the suspects crashed into a car at 108th & Avenue D. Nearby police recognized the vehicle and moved in for the arrest. One suspect was arrested while the other fled away on foot. Some 42 catalytic converters were retrieved with a value of at least $5,000. Excellent job by our men and women of the Chicago Police Department! Congrats to those local officers involved with this successful arrest! 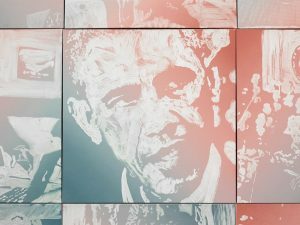 The Obama Paintings, debuting at the Stony Island Arts Bank on April 18. Lakeside Alliance Resource Center Construction Career Info. Senior Housing Conference at the Quarry Jazz Night.